The tower , completed in 1937, is an integral symbol of the University of Texas. The town knows when we win a game, because the tip is lit burnt orange (instead of its normal white), and when any team wins a championship, the whole thing is lit burnt orange. When I went to school, the tower was locked off and unavailable, so I was thrilled a couple of years ago when they opened it back up. The tour is about 45 minutes. The first five to ten minutes of the tour are a brief history and info session about the tower. I even learned some things I didn't know: Who knew the Perry Casteneda library was built in the shape of Texas? And apparently they removed the last books from the Undergraduate Library a few years ago, and the PCL is the only library with books?? At the top, you are free to roam for about 30 minutes and check out the amazing views of downtown. The clock faces, which seem so small from far away are actually 14 feet tall! One of the foremost university art museums in the United States, the museum holds over 17,000 permanent works of art, including European paintings, an encyclopedic collection of prints and drawings, and modern and contemporary American and Latin American art. This free science museum was built in 1939. And with its hushed halls, it sometimes still feels like that year still inside! This is a favorite of children of all ages, it displays dinosaur fossils, meterorites, dioramas of all different sorts of Texas wildlife and an Explore Evolution section. Very kid friendly! 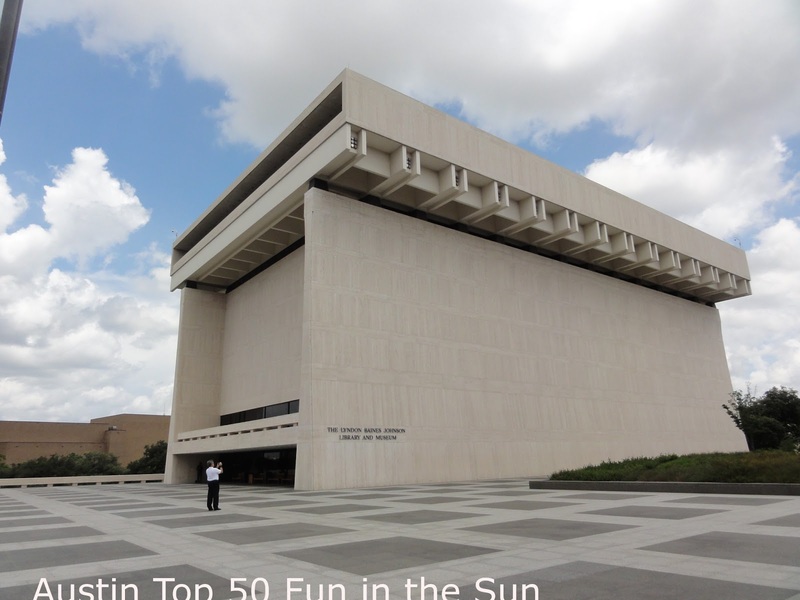 This newly renovated museum gives an in-depth look into LBJ life and accomplishments. Interesting movies and interactive displays make this museum interesting for children of all ages. Looking for a fun break from the museums and tours? Take some time to go bowling at the underground 12 lane bowling alley and billiards hall. It is one of my boys' favorite places in town to go bowling, with its black light, disco ball and Air hockey table, we are always assured of a fun few hours!! View the Gutenberg Bible, printed around 1454, and the extensive collections of rare books, manuscripts, photography, film, and art held in this treasure. We recently learned about this gem hidden in the Development building. Hung in the middle of a stairwell, this is a fantastic side trip for anyone who loves science! Note, the building is off-the beaten path, across the highway from the main part of campus.